Q: How come "which ifconfig" (runing as a user) finds nothing, yet "sudo ifconfig" does work? A: sudo has a compile-time parameter called with-secure-path, which sets a different PATH for the sudo environment. Debuntu secure path contains /sbin:/usr/sbin, and that's how it works. This feature gets two goals: convenience (no full path required for common root cmds) and security (ignoring potentially bad user PATH). NOTE that RHEL doesn't use this option, and running "sudo ifconfig" there simply fails. Q: How come sudo requests a password only on the first run? 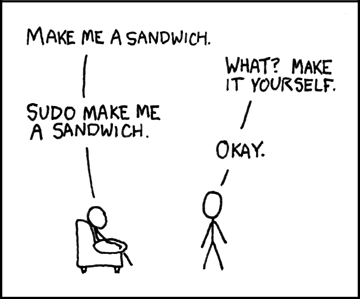 A: Sudo has a nice mechanism for creating these "sudo session" things. After authentication, sudo creates a 'timestamp dir' (in /var/run/sudo on my Debian), then uses its date to check when the last successful authentication took place. Session timeout is configurable, defaults to 15mins. sudo -k kills this session by simply removing the timestamp dir. Just a quick insight from my workplace: to my surprise, a setuid binary deliberately ignores many environment variables such as LD_LIBRARY_PATH and LD_PRELOAD. This entry was posted in Linux/Unix and tagged FOSS, ld_library_path, Linux/Unix, setuid, sudo, suid on December 11, 2009 by Oren. A lesson learned: in order to mount an LVM device on another machine or simply another OS (e.g., from within a live cd os, mount the local machine's volumes), the LVM volume group must be exported and then imported. This is done using the vgexport / vgimport commands. Another requirement, is to have lvm2 package installed (so lvs command actually sees the volumes), and device mapper module should be loaded (dm-mod) or builtin the kernel. Thanks for Amir who found that out. By the way, I've recently found the dmsetup command very useful. This entry was posted in Linux/Unix and tagged Linux/Unix, lvm, storage on July 19, 2009 by Oren. However the output was only: EVIL_BASH, instead of having the lines of the /tmp/myfile appended. Because of the PIPE, the whole 'while' loop runs in another subshell. This means that $all outside the loop is not the same $all from within the loop! Sounds simply like scoping (as in perl), but a really awkward one. Beware. This entry was posted in Linux/Unix and tagged bash, FOSS, Linux/Unix, shell on July 10, 2009 by Oren. I got confused: should I use insserv or chkconfig on SLES? How do they differ? Apparently, chkconfig is a perl wrapper to insserv, which actually mimics chkconfig very well. This entry was posted in Linux/Unix and tagged Linux/Unix, rhel, suse on June 29, 2009 by Oren. 1. Atheros wifi driver: I've been using the madwifi driver until now, which is not a part of the kernel because of licensing issues (contains proprietry firmware I guess). CentOS 5.3 introduced the ath5k driver, which is a free implementation. However, ath5k still doesn't implement "access point" mode, so I had to disable it (renamed ath5k.ko and ran depmod -a), and reinstall madwifi 0.9.4 instead (simply running make; make install). 2. udev.rules were overwritten, which cleared the changes I've made, in particular the /dev/snd permissions were reverted to CentOS default (no "audio" group, only the device owner can access audio), so I had to re-change the /dev/snd/* file permissions. This entry was posted in Linux/Unix and tagged centos, FOSS, Linux/Unix on April 17, 2009 by Oren. After the Lenny release, nobody can say that Lenny is not a rock-solid OS. Furthermore, nobody can say that sid(unstable) is not bleeding edge enough. Especially after kde4.2 made it into sid. The kde4.2 upgrade process succeeded smoothly on my place. I've also "upgraded" my Lenovo X61 laptop from Ubuntu to Debian sid with a surprising success. I really feel better now, with Debian. Expert community: the average debian bug report is much more professional than an ubuntu bug, which is sometimes just a mess made of dozens of people saying "ohh it also happens to me!! please fixxx!". In other words, Debian users seem to be more tech savvis. KDE is quite a stranger in ubuntu. Kubuntu is quite uncommon, which makes it a little less intensively developed. In Debian there's no such partition. Debian is KDE as much as it's GNOME. I like KDE, so it feels more native to use Debian. This entry was posted in Linux/Unix and tagged debian, FOSS, Linux/Unix, ubuntu on April 13, 2009 by Oren.